Every tooth that fractures can be a dental emergency. The trouble is that some are too tiny to be seen, even by a trained eye. In the past ten years dentists are seeing more patients with a cracked tooth. Early diagnosis and treatment is the key to a good outcome. “Cracked tooth syndrome” is when a patient shows up with “chewing pain” usually on one side of their mouth. But often the patient can’t tell us which tooth. 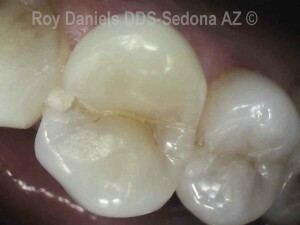 Sometimes we are looking for a “hairline crack” in an apparently healthy, cavity-free tooth. Cracked tooth, the crack is barely perceptible to the eye and does not show up on an x-ray. The American Association of Endodontists have classified five specific variations of cracked teeth; craze line, fractured cusp, cracked tooth, split tooth, and vertical root fracture. Most cracks tend to be superficial, and involves just part of a cusp on the tooth. But every crack is unique. Sometimes the split is vertical, but sometimes it is horizontal or even diagonal. The good news is that 9 out of 10 cracked teeth require uncomplicated treatment, but that one in ten requires a more complicated plan. Experience can help us isolate and diagnose the crack and the degree of complexity. Pain that comes when you chew harder foods, like corn chips can be a clue. We test the suspected cracked tooth – teeth, one at a time and also use our intra-oral camera to photograph the problem. If you have a cracked tooth symptom, call us today and get it diagnosed. 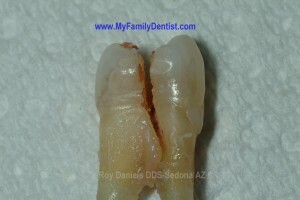 The earlier that a cracked tooth is treated, the dental costs will be less. Dr. Daniels will discuss your diagnosis with you and your treatment options so that you can make a dental treatment choice.